The Square and Round Dance Federation of Nova Scotia (SRDFNS) is made up of all modern square, round and contra dance clubs in Nova Scotia who wish to join. It is the Provincial level of the tier of Square and Round Dance organizations. Thus it acts as the umbrella agency for the clubs and the regional associations within Nova Scotia and in turn funnels information and services to and from Nova Scotia to the Canadian Square and Round Dance Society. to support and supplement the work of the Association of Nova Scotia Square and Round Dance Teachers, Dance Nova Scotia, and the Canadian Square and Round Dance Society. 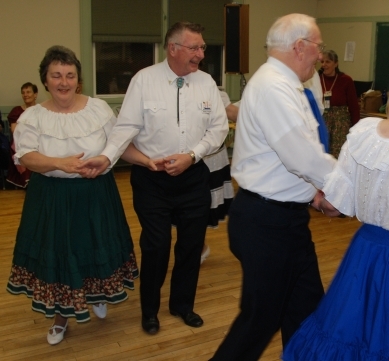 The Square and Round Dance Federation of Nova Scotia website is a hub for Square and Round and Contra Dance. It features information about local clubs throughout the province as well as general facts about Square and Round (and Contra). The website also includes schedules on upand coming events, drop in classes, leaders, callers, news and general inforamtion on members and provincial, national and International activity. For more information contact Dottie Welsh at the link below or go to the SRDFNS website.